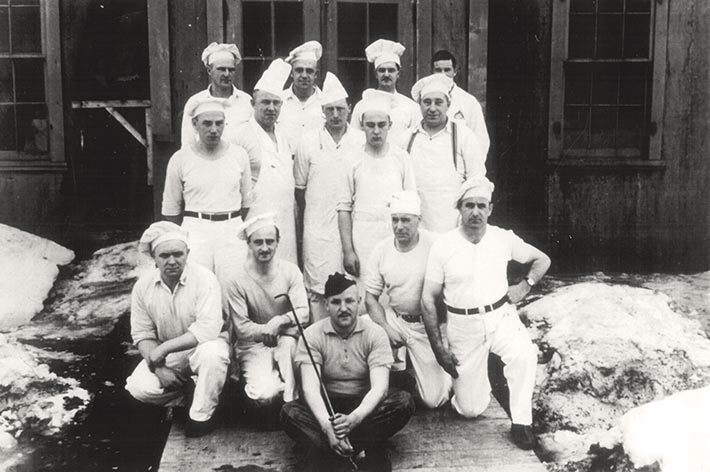 Black and white photograph showing 13 individuals dressed in white kitchen attire, all but one wearing tall chef hats, posing for the photograph. One individual is shown centered, wearing what appears to be soldier attire, suggesting perhaps he was a supervisor of this group. The photograph is from Camp Fredericton, where in July 1942, Italian Canadians still considered a threat by the Royal Canadian Mounted Police (RCMP) were transferred from Petawawa. This camp was the only one of its kind in eastern Canada.